Radiating Beauty is a great way to combine shades of color together into a colorful quilt. 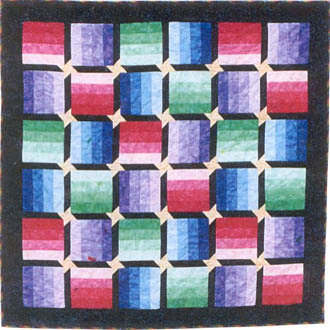 Measuring 48" square, this simple pieced design uses four different shades of each color going from very light to very dark to create each block. You could use very small prints to achieve the same effect. Adding sashing & stars only makes the colors stand out on this Radiating Beauty quilt. Price includes shipping and handling.